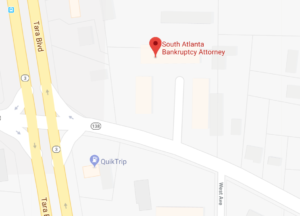 South Atlanta Bankruptcy AttorneyAbout UsWhy Choose Us? Since 1992, we have operated as a local law firm in Newnan, GA dedicated to putting the needs of our clients first. When choosing an attorney, it’s vital that you choose a firm that will give your case the sufficient attention. We pride ourselves in taking time to make sure your specific details and information are both correct, and up to date. We have over 30 years of combined experience in helping people file for bankruptcy, and you can depend on us to be up front and honest at all times. We always provide a FREE bankruptcy consultation that allows you to review your options before proceeding.